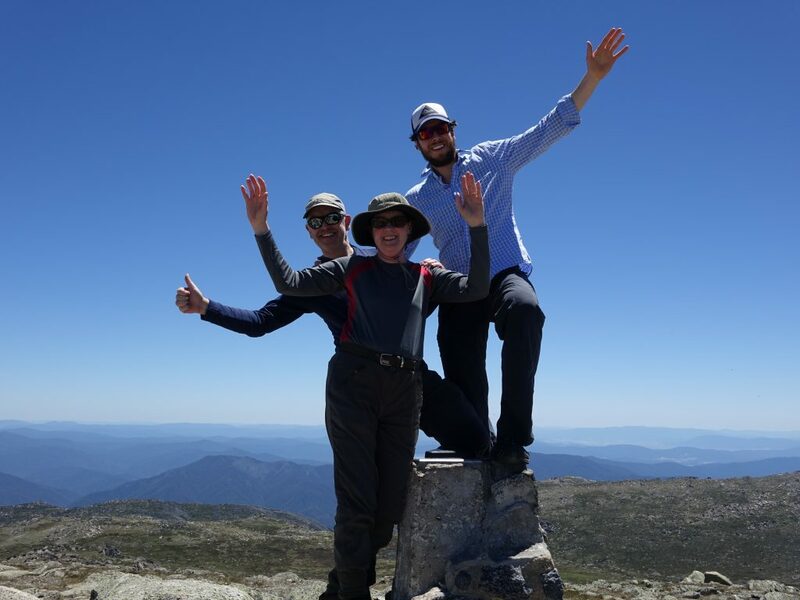 Having climbed the five highest peaks in Australia, we left Kosciuszko National Park and returned to Wangaratta a few hours’ drive to the south west. Here we had to say goodbye to Dan who had to go back to work. The temperature was in the low 40Cs. We were positively melting. We found a place to eat before dropping Dan off at the rail station and stayed the night at a local B&B. The next day we had a pleasant drive of an hour and half or so back towards the mountains to the south-east. We wound our way along the, perhaps inappropriately named, Snow Road and on to The Great Alpine Road to Porepunkah and Bright, two tidy towns set in the Ovens valley – an appropriate name considering the heat. Soon after Bright we turned left onto the Tawonga Gap Road which lifted us up and over a pass along an occasionally steep road of switchbacks. At the top of the pass there was a car park and viewpoint where we stopped for an hour to obtain some relief from the heat. The view across the Kiewa valley ahead was to my next objective, Mount Bogong. 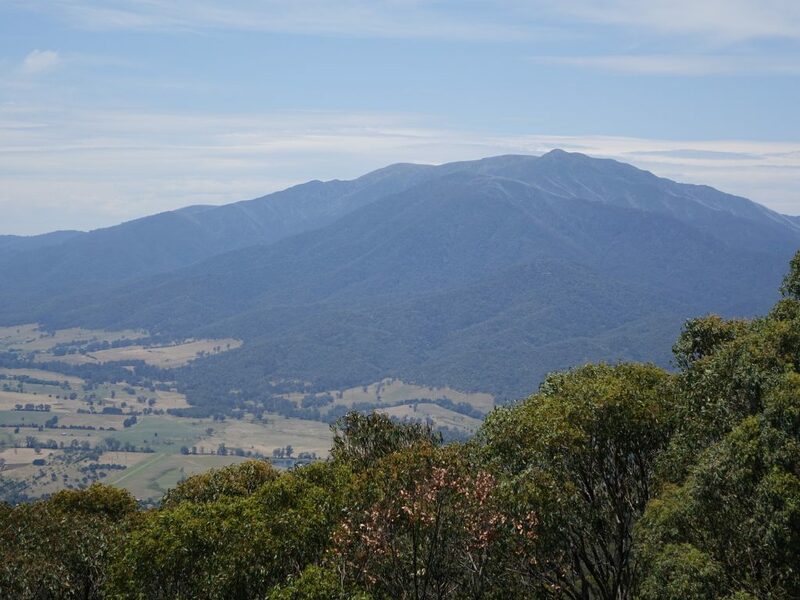 Mount Bogong is the highest peak in the State of Victoria at 1986m (6156ft) in height. It is thought also to be the remains of an ancient volcano. Bogong in the local Aboriginal language means “Big Fella”. It is certainly one of the most prominent mountains in Australia. It is also a significant location for the local indigenous people, being a location for collecting Bogong moths and as a meeting place for tribes far and wide. Bogong moths were collected and eaten as a protein rich food. 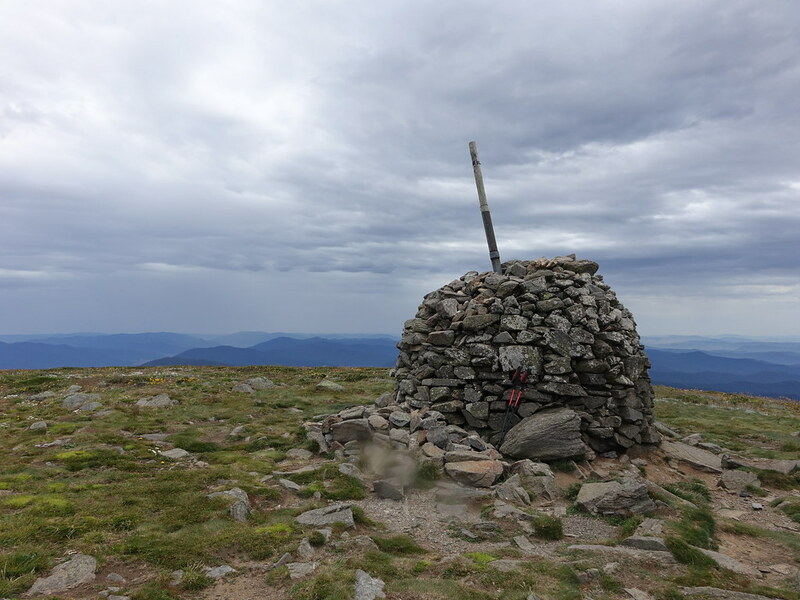 Although of relatively modest height, Mount Bogong can be treacherous in bad weather as ways off the massive plateau that forms its summit are not always obvious. After leaving the viewpoint we drove down into the valley. 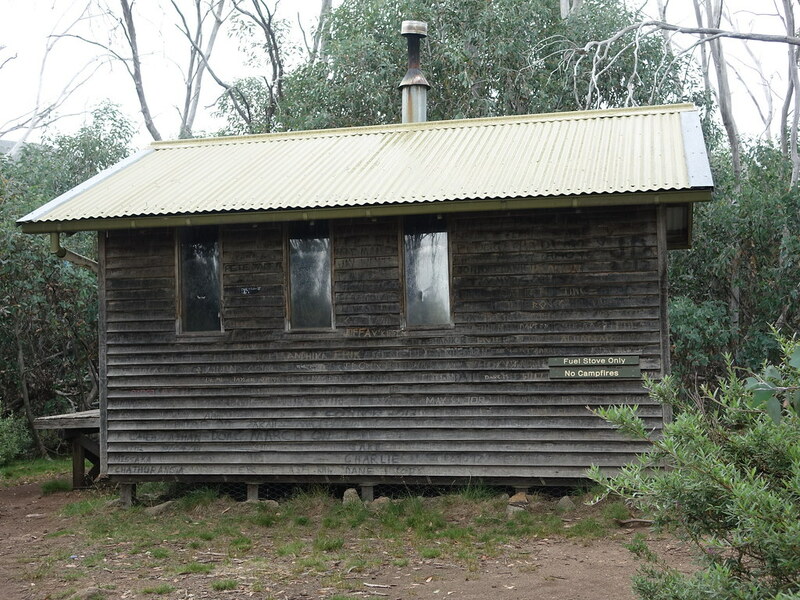 Julie had organised an AirBnB in Tawonga South a small settlement near Mount Beauty. Before going there though I decided to recce the start point for the climb which, weather permitting, I was hoping to do the following day. So, instead of turning right toward Mount Beauty, we turned left and then after a couple of kilometres turned right along Mountain Creek Road to the picnic area and car park at the end of the tarmac road. We duly then found our accommodation and I prepared for the following day. The forecast was alright. A weather front was moving in bringing with it some high cloud and strengthening winds during the afternoon. I was always intending an early start and this forecast confirmed the decision. So I was off the following morning at 5.30am. There was one other vehicle in the car park but I was to see no-one else that day. There was also someone camping just behind the car park with a car adjacent to the tent. A 4WD track exits the back of the car park with signs pointing the way. Just over 2km and five stream crossings later I reached the bottom of the Staircase Spur. There is little risk of being cut off should it rain because each of the stream crossings has a pedestrian bridge . It is not possible to miss the start of the trail up the Spur. A sign shows the way. 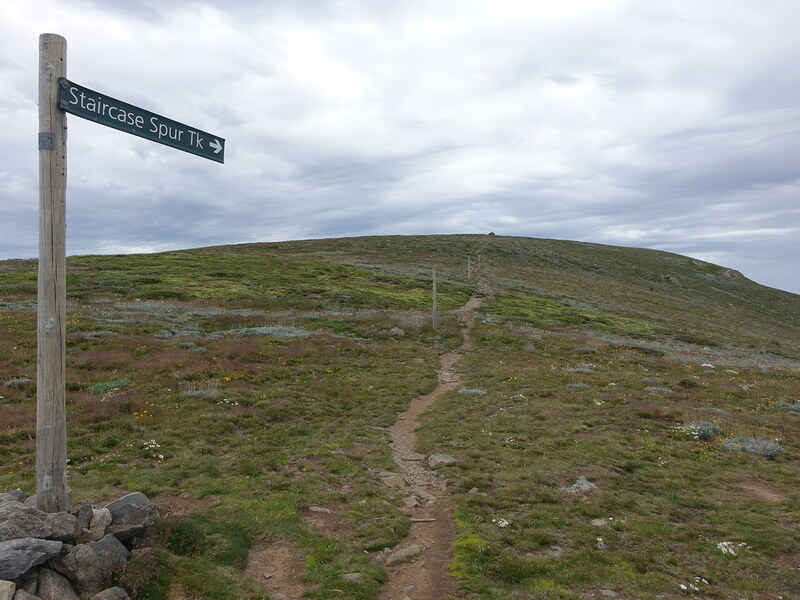 The sign at the start indicates that it is 6km to the summit of Mount Bogong. 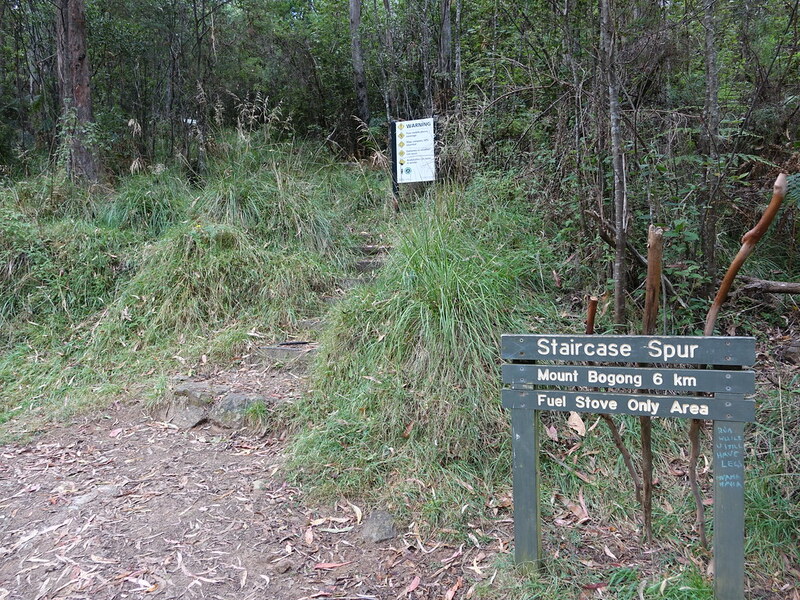 Wikipedia describes this Spur as “a difficult ascent due to its steep slopes”. I did not find the path as steep as suggested. Topographically, the Spur rises in a series of series of steeper sections interspersed with occasional more level ones – hence the name of the Spur. But the path is fairly relentless as it winds its way up amongst the snow gums. Only in a few places did the trees open up so as to give views. Half way up the Spur is the Michell Hut with adjacent drop toilets. The hut is supposed to be used in emergencies only. I went in to have a drink and something to eat. Although the promised cloud cover had arrived, it was still warm. The trees sheltered any breeze that there might have been. In the hut was a bench, a lot of cut wood with a wood burner, a table and sleeping platforms. The path is obvious all the way to the top and follows large wooden posts once above the tree-line. Above the tree-line it also became distinctly cooler in the strong breeze. The landscape opened up abruptly. No scattered trees. One moment trees, the next open heath covered slopes. 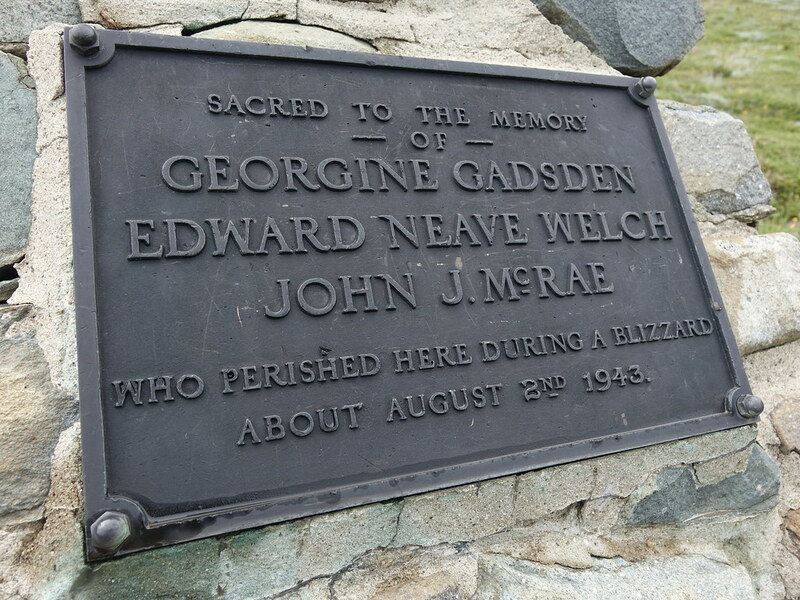 As if to emphasise how treacherous this environment can be, I passed a memorial to three people who died here in 1943. Of course, on this day, the conditions were far more benign for me. The Spur continued in a pleasingly narrow way until the plateau was reached. The summit cairn was just visible on the skyline to the right. I was soon up to the cairn. The views were expansive, if a little gloomy. They included Mount Buffalo and its Horn that I would do the next day about 60km to the west. Here is a short video I took at the top. The wind gusted freshly across the broad exposed plateau. After I had scaled the large cairn, I then used it as a shelter whilst I took in some more food and drink. It had taken me about 3 hours from the foot of the Eskdale Spur and it would take me about 2¼ hours to make the return trip, including stops at the hut half way and at the top. I returned the same way. As I was speeding down the path back in the trees, something caught my eye just ahead of me. I stopped a couple of metres short of it. There, on the path, a red bellied black snake also stopped. I looked at it and it looked at me. It had no doubt felt the vibrations I was making as I pounded down the path. Eventually, it decided I was not going to attack it and it slithered off to my right. Just 15 minutes later I then had a very similar experience. This time the snake was much larger but it was already making its way into the undergrowth to my left. Of course, on neither occasion was I quick or brave enough to find my camera to take pictures of either of them! The rest of the descent passed without incident and I was back in Tawonga South by 1.30pm. Australia is not known for its mountains, with one exception perhaps. The exception is Mount Kosciuszko which to some counts as part of the Seven Summits (the highest summit on each of the seven continents). I will not debate here whether or not it or Carstenz Pyramid on the island of New Guinea should count as the Australian/Australasian representative in that list. Mainland Australia has two principal mountain areas. 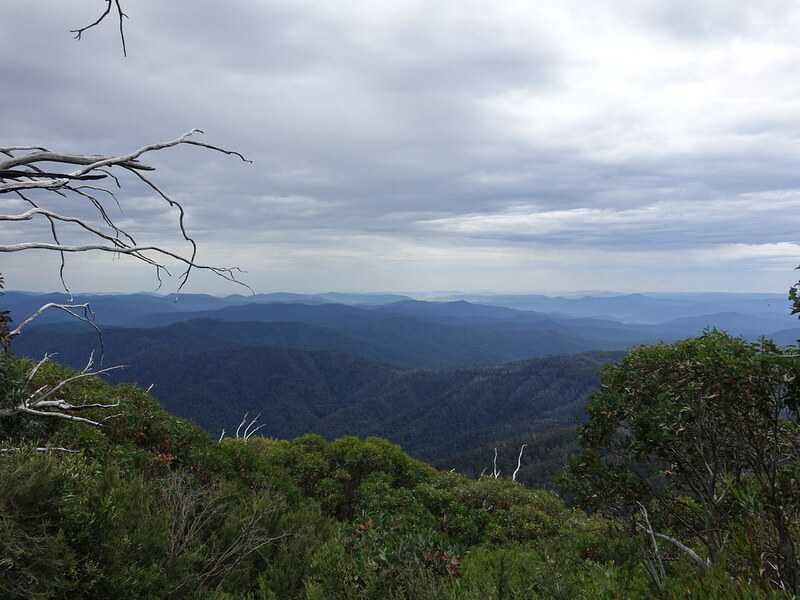 The first is the Great Dividing Range which runs north-south through Queensland and into northern Victoria. The Snowy Mountains area forms the southern end of the Great Dividing Range and lies in southern New South Wales and northern Victoria. The other area is on the island of Tasmania. As Australia is an old continent, geologically speaking, any spikiness in its peaks has long since eroded away. The northern end of the Great Dividing Range, located as it is in tropical and sub-tropical Australia, is covered in forest such that even the topmost heights are covered in trees. The Snowy Mountains though with their more southerly position a little further from the coast are not. They are slightly drier but, as their name suggests, attract winter snows. The Snowy Mountains in their upper reaches form plateau-like areas exposed to the elements and have an alpine climate. In some respects they resemble the Cairngorms with big open spaces, granite and the peaks swelling up from the plateau. Heavy winter snows enable some ski resorts to thrive such as at Thredbo in NSW and Hotham in Victoria. The five highest “peaks” in Australia are in “the Snowies”. In fact all are within 6km of Mount Kosciuszko as the kookaburra flies. Australia recognises a prominence of 60 metres to determine whether or not a top counts as a separate peak. On that basis, Australia has 17 summits over 2000m in height. My aim was to climb the five highest peaks in the two days we had in the area. The infrastructure in terms of paths and, indeed, a chair lift is good and there is signage on the main routes. I did not undertake the objective in the most efficient way. Indeed, in a very long day, it would be possible to tackle all five in one go. We had arrived in Australia in the midst of their summer. It is normally hot but we were to experience temperatures in the high 30’s in Melbourne and even up on the Snowy Mountain plateau the temperature was in the low 20’s. In Melbourne we met Dan who had been on my Sidley trip the previous January and we drove to Thredbo in a 6½ hour drive from Melbourne. We had left it late to leave Melbourne and the final couple of hours of driving were nerve wracking. Away from the cities driving in the dark is not always a good idea as kangaroos, deer and other wildlife tend to wander out in front of you onto the road. Anyway we arrived without denting the hire car and agreed a time to meet in the morning. At 8am we were at the foot of the Kosciuszko Express, a chairlift that cuts out about 550m of the climb in a 15 minute ride. It is used by walkers and mountain bikers. For us it was a warm sunny day. The chairlift was popular. The Kosciuszko climb is popular. Thousands climb the peak in any year. The first two thirds of the walk from the top of the lift is on a raised metal walkway, put in to prevent erosion. Fortunately, at this time of day, the traffic was largely in one direction. We felt overdressed with our walking boots on. Many were dressed just in T shirts and shorts with trainers. On this day they would get away with it. And we arrived at the second that looks out over Lake Cootapatamba. This lake is one of only five lakes in Australia created as a result of glacial action. It is also Australia’s highest lake. It was to be the scene of later activity. The walkway cedes to a normal (if wide) maintained trail at Rawson’s Pass. But before then we diverted to Etherington Ridge (Australia’s 5th highest at 2180m) which lies a short way off the walkway to the east. There is no path up but the rougher ground is easy enough and this summit is capped with a rocky top. We could see down to Rawson’s Pass and across to Kosciuszko. Here Dan produced a new toy – a drone. We had a play with it for 30 minutes or so as he buzzed it around our heads and across the void towards Kosciuszko. After that interlude we descended to Rawson’s Pass. Once upon a time the public could drive up to this point. Indeed there was a Ranger vehicle there. At this point we met the Main Range walking track. There are also toilets. The Main Range Track starts and finishes at Charlotte Pass to the north east and provides a 20km circular walk passing by many of Australia’s highest points. Charlotte Pass is another favourite starting point for an ascent of a Kosciuszko. 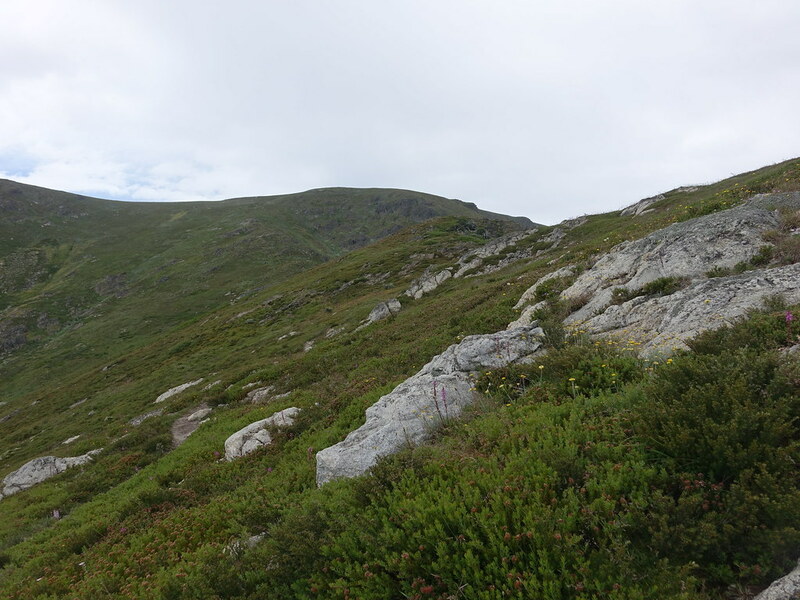 Charlotte Pass is named after Charlotte Adams who in 1881 was the first European woman to climb Kosciuszko. We were now back with the crowds. The track up Kosciuszko now spirals around the back of the rise ahead and takes far less than the 40 minutes mentioned on the sign in the previous picture. We were soon on the top of Australia at 2228m. The views are extensive. The summit was crowded. Here is the view down to Rawson’s Pass and Etheridge Ridge. Across to Ram’s Head (Australia’s 4th highest at 2190m). And having fought for a spot at the trig, the three of us. Normally it would only take a little over an hour to the summit from the top of the chairlift. With our diversion and play it had taken us over twice this time. We still had a bit to do. So after a quick bite to eat we left. Our next objective was Lake Cootapatamba. Dan wanted to swim. His objective was to swim in Australia’s three highest lakes. We were soon down to it. And Dan contemplated the task in hand. There was some further playing with the drone. I won’t embarrass Dan by publishing my video of the swim. But the water was warmer than expected (at 20C) and the swim was achieved. I still had Ram’s Head to do. Julie wanted to catch the last chairlift down to Thredbo and Dan needed to dry himself and sort out his drone. So I headed off alone. It was a bit of a plod up open slopes passed the tor of North Ram’s Head and then to the summit. This was the view back to Kosciuszko. I arrived on Ram’s Head at the time of the final chairlift down to Thredbo. So I was in for a long trek back to our hotel. The direct route from Ram’s Head to the top of the lift was very rough and took me an hour. From there I could follow a motorable track or a walker’s trail. A further hour later I was back down and ready for a drink as I was fairly dehydrated by then. Today it was just Dan and I. Julie was going for a more leisurely walk looking for wild horses. Dan and I took the 50 minute drive around to Charlotte Pass. Charlotte Pass is only 8km away from Thredbo as that kookaburra flies, but it is 70km by road. We got to see the massive Lake Jindabyne which is used as a reservoir and the ski resort at Perisher. Today was even hotter than the previous day. It was in the upper 20s when we parked up at Charlotte Pass shortly after 9am. This would likely be the starting point if looking to do a trip around all five of the top summits in one. Even better, if transport could be arranged, would be a through walk from Charlotte Pass to Thredbo. The first stage involved a loss of 200m of elevation as a well-made path dropped through scattered snow gums to the Snowy River. In spate, the crossing could be tricky (or impossible) but in the middle of summer, the strategically placed boulders made for a dry crossing. The Snowy River system forms part of a much larger project that provides irrigation and hydro-electricity. It seemed hard to believe on this day of low water levels and heat. The track continued obviously up the hillside ahead. It is motorable at this point and creates a bit of a scar. We continued for a further 25 minutes to a junction. To the right down in a hollow was Blue Lake. To the left the Main Track continued. Ahead were broad slopes that would lead me up Mount Twynham (Australia’s 3rd highest at 2195m). Dan wasn’t going to join me on Twynham. His objective was to swim in Blue Lake, the second highest lake in Australia. We agreed a time to meet and we set off on our separate ways. Before leaving I chatted to one of a group of four who were on a three day backpack trip covering what I would be doing over these two days. I did not envy them their heavy loads in the heat. The slopes ahead crunched under my feet, a reflection of the dryness and heat of an Australian summer. The heat was oppressive and even on reaching a ridge line there was no breeze. There was however the trace of a track, not marked on the map I had. Twynham was still some way off as the broad ridge swung around behind the coombe holding Blue Lake. The track went over a small rise before dropping and regaining its upward course as it turned to the right. After a steepening the track disappeared and the way went over a number of low parallel dykes. I reached the top festooned with the remains of a structure of that was presumably once used for surveying. As expected the views were expansive. Here is a shot looking over towards Kosciuszko (centre) and Mount Townsend (Australia’s second highest at 2209m). Mount Townsend was my next objective. In all other directions were blue hazy hills and ridge lines stretching into the distance. It was hot even up there. I drank half a litre of water and ate a bit. I renewed my sunscreen and then left. Five minutes from the top I heard a high pitched buzzing sound. I turned to look to see what it was, although I already suspected. Dan had sent up his drone to find me. He was out of sight, but I was in his via the camera on the drone. I waved at it and continued on my way down. I passed the group of four backpackers without their loads but strung out over 400m or so. Like me they were wilting a bit. At the appropriate point I left the ridge and started down the slopes towards the Main Ridge Trail. I could now look down on Blue Lake. It certainly looked blue. I could see Dan way below and signalled to him that I would meet him further along the track. We converged just short of a welcome stream where another group of backpackers had given up progress. Did I mention it was hot? Dan was suitably refreshed from his swim but disappointed at the water temperature. It had been 15C – he had wanted it colder. I dipped my hat in the burbling water of the stream and placed it, full, over my head. After the initial brain freeze it provided needed relief with water dripping down my face and down my back. There is a risk of giardia in these waters so I did not top up my water but drank another quarter-litre and stuffed a muesli bar into my mouth. By the time we were ready to leave my hat was largely dry so I repeated the soaking. The next point on the Main Ridge Trail was Carruthers Peak. This is the only summit that the Trail passes over (at 2145m). At places on this section stone steps have been laid. On the summit is a small plaque installed by the Snowy River Hydro Authority. Here is the view back towards a distant Mount Twynham. 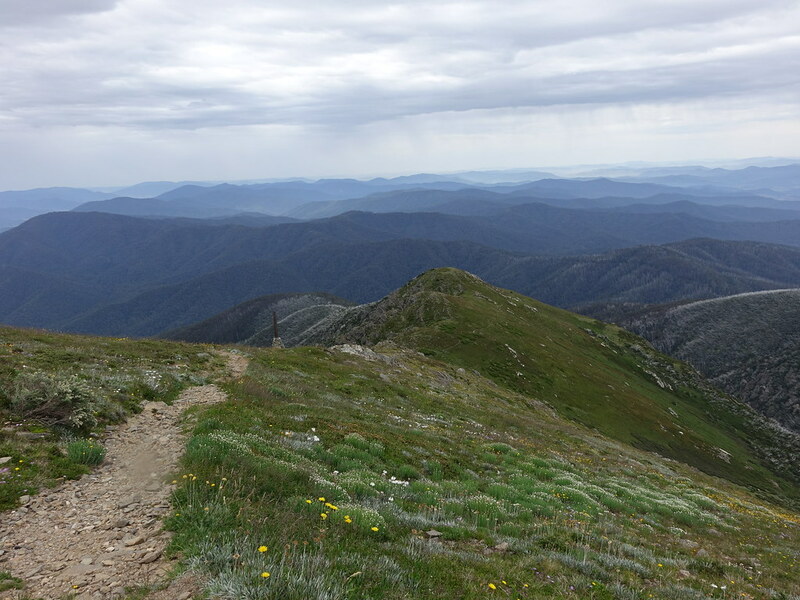 And on towards Kosciuszko (left) and the more isolated Mount Townsend (right). Dan provided some nice perspective for the blue hazy ridges. The descent off Carruthers continued the straightforward nature of the Trail. 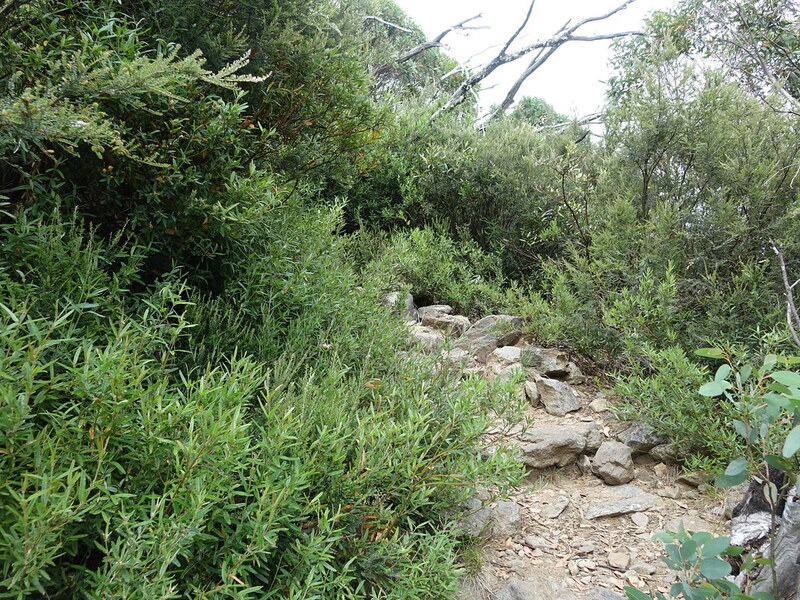 The path passed through a specially protected area of alpine plants (there remained many still in bloom). It bypassed Mount Lee (another 2000m top but with relatively little prominence) and continued on towards Mount Northcote which the Trail bypassed on its bouldery western slopes. Before we reached this point though we plunged down steep slopes on our right. Nestled down in the valley was yet another lake – Lake Albina – Dan’s third objective of these two days. The Lake is shaped like a peanut. He would swim across the Lake at its narrowest point. Despite the heat, I did not take up the offer of joining in the dip. Instead I went around the head of the Lake. I found a bit of raised ground with a conveniently placed boulder. So I sat and had another ½ litre of water feeling the sweat drip down my back. Chewing on a muesli bar I watched Dan prepare for his swim about 300m away. Once he set off, so did I. At one of the inflows to the Lake I filled my hat with water and poured it over my head. I had a steep 200m climb ahead of me. I found a grassy gully studded with rocks and oozy sections. Every step I took disturbed the local residents. Hundreds and thousands of grasshoppers and other insects were hopping downhill around my legs. They were of different sizes, some tiny, some perhaps 5cm long. The ground seemed to be moving in a stream of greenness – green spindrift with wings and legs. Eventually the stream abated as I neared the ridge above. As with all ridges in the Snowies, it was broad and ill-defined. I turned right. Dan was coming up a different way. I found a narrow path that came from the direction of Muellers Peak to my left and followed it until I found a suitable rock I could sit on and wait for Dan. I was now running low on water but drank about half of what was left whilst battling the May flies that attempted (and sometimes succeeded) to bite me. Dan and I managed to miss each other. So I continued towards the summit of Mount Townsend. There was a short section of tricky scrambling and I popped out on the top. There was Dan by the trig point! Mount Kosciuszko is behind him. And here is yours truly. We were now a long way from our starting point. An interesting return would have been to follow the south ridge off Townsend, bypass Kosciuszko and descend to Rawson’s Pass. From there the Track would lead back down to Charlotte Pass and complete a pleasing circuit. However, Dan had left his rucksack back down on the far side of Lake Albina. So that meant that we returned the same way we had come out. Whilst it was shorter than the route described in the previous paragraph it involved climbs out of the Lake Albina basin, over Carruthers Peak and up from the Snowy River. The climb from Lake Albina was done with gritted teeth and a couple of stops. Dan had another swim. We met up before the climb up to Carruthers Peak, stopping briefly to talk to a couple who were going to camp up on the plateau. On top of Carruthers it was clear that we were going to get back to Thredbo quite late. As there was some phone reception Dan was able to message Julie to ask her to order some food for our return. The Trail on from there down to the Snowy River crossing was straightforward though we spotted this snake on the path. On researching what breed of snake it was after the event, I realised that we had been taking a bit of a risk getting so close. It was an eastern brown snake. Eastern browns are is regarded as the world’s second most venomous land snake!! Fortunately, like us, it was affected heat and so pretty lethargic. Further along we rested a couple of times, poured water over our heads from streams we passed and eked out our remaining water. Eventually we reached the river. The sun was setting and it cast a soft light as we crossed the river. I had the last of my water and we set off back up to Charlotte Pass in determined fashion. 20 minutes later we were at the car. We dumped our gear in the back, jumped in and were off. I was keen to get back to Thredbo before dark fell to avoid creating road kill. We didn’t quite achieve that but walked into the pub at 8.55pm, 5 minutes before food stopped being served. Julie had ordered the food and, even better, there were beers lined up. I do not think that I had ever been as dehydrated after an outing. It took me a couple of days fully to recover. But it was great to have climbed the five highest peaks in Australia in the two days. From there it was on to the highest peak in Victoria.